Please let us know what you find works best. Even a small 1GB-2GB pagefile should be enough. You can optimize by placing it on another spindle, you can tune via Windows and via vCenter if you use it, and other VM tuning options. Storage layout and options matter as well. Using a large distributed storage solution adds another dimension. If you can run without pagefile that is best for most applications, perhaps you can try bumping up the RAM allocation to 8+GB as a test to see if that helps blossom the available resources - with and without pagefile. Well, PF was already set to 2GB... I think reinstalling VMware tools and updating via Simplix reduced the GDI+ leaks on Linux. 19H1 still doesn't work with EMC2/Dell's VMware Workstation. I'm using VBox now. Try opening the multiple instances of system info on different windows with different views/options. Use default Aero/basic theme for testing. Theme/UI packs changes the behavior sometimes. Do you have latest updates say March updates installed using Simplix update 19.40 or higher? @hmscott did you observe this issue? Why would anyone do that though!? 6.|THE|1|BOSS|.9 and Mr. Fox like this. It doesn't mean you shouldn't use it. Different users have different requirements. I'm not bashing Win 7's weakness but I never observed it ever. I ran W7 on crappy hardware say single core pentium chip, 1GB RAM and 100GB HDD. Newer update might have messed it up. Its GDI+ objects issue like @hmscott said. Robbo99999, 6.|THE|1|BOSS|.9 and hmscott like this. Same results, nothing but pure butter. I am running with the latest integrated updates through March, minus the BS knowledge bases. Honestly, what you describe is not a common problem with Windows 7, and would be looking at exactly what you are doing to create the problem. I have not seen it on any of the tech, or news sites, nor Microsofts support site. It sounds more like a localized issue, and not one that affects Windows 7 as a whole. Vasudev, 6.|THE|1|BOSS|.9 and hmscott like this. It could be a cancer update. If you let the Redmond Retards have their way, it's not a matter of if but when something gets screwed up. And, these dullards have had ulterior motives designed to sabotage Windows 7 since July of 2015. Vasudev, hmscott, Papusan and 2 others like this. Did you know Microsoft, Google, and many other Western tech companies have partnered with Chinese military universities for research into cutting edge technology, including artificial intelligence, computer deep learning and facial recognition cameras and software. The fruits of this research are currently being used to persecute the ethnic Uighur Muslims of Xinjiang. Even MIT is in on the action. Hidef1080, Vasudev and Papusan like this. I hope the issue doesn't come back. Robbo99999, Papusan and Vasudev like this. They could have used Android/iOS phones as security keys just like Google did! 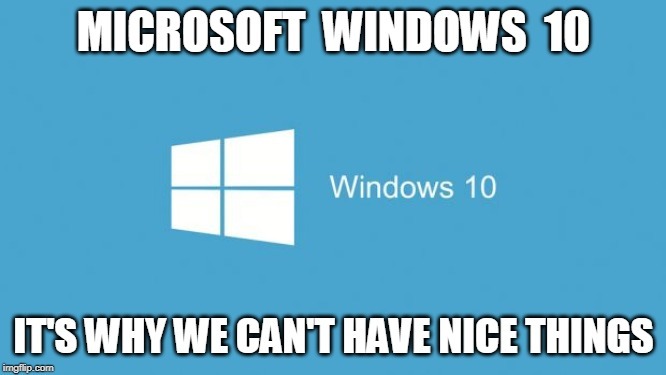 Windows 10 May Update your PC in 2019.
intruder16, 6.|THE|1|BOSS|.9 and AHMED KARAM like this. Papusan, Vasudev, hmscott and 1 other person like this.